Asian contestants are also expected to medal in figure skating and skiing events. The Winter Olympics used to be the exclusive domain of European and North American countries. From its inception in 1924, that stranglehold wasn’t broken until Japan’s Chiharu Igaya won a silver medal in men’s slalom in 1956. North Korea’s Han Pil-hwa became the first Asian woman to win a Winter Olympics medal in 1964, with her silver in the 3,000-meter speed skating in 1956. But after that, Japan would be the only Asian country to sporadically grab medals, most notably in 1972, when it won three while hosting the Games in Sapporo. The big breakthrough for Asian countries came in the 1992 Winter Games in Albertville, France. For the first time, multiple Asian countries ended up on the medals podium (four, in fact). And the reason for the sea change? 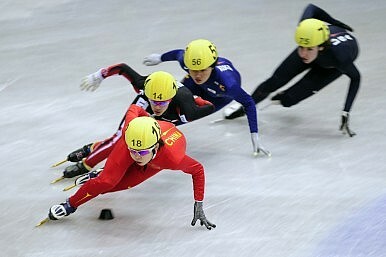 The introduction of short track speed skating as an Olympic sport. Since short track’s adoption in 1992, Asian athletes have absolutely dominated this discipline. Skaters from South Korea, China and Japan have won more than half (64) of the total 120 medals contested, including 27 of 40 golds. As a result, these three countries have won at least one medal in each of the last five Winter Olympics. That trend is set to continue at the 2014 Winter Games, which begin on February 7 in Sochi, Russia, with South Korea, China and Japan are all expected to win multiple medals. But the haul will come from more than just short track speed skating. Those 2010 totals just might be exceeded in Sochi if Asian athletes perform to expectations. In fact, the competition between the “Big Three” Asian countries is just warming up, as the 2018 Olympics will be held in Pyeongchang , South Korea – the first Winter Games ever on the Asian continent and the first in Asia since Nagano 1998. South Korea – The Korean contingent is coming off its best performance ever in Vancouver, finishing fifth in the medal standings with six golds and 14 total – all records for an Asian nation. Headlined by Yuna Kim, the 2014 squad might improve on all of that. While Kim is favored to become the first to repeat as the women’s figure skating winner since East Germany’s Katarina Witt did it in 1988, South Korea is expected to get the rest of its medals from speed skating – on both the short track and long oval. The Koreans could win as many as eight golds and 15 total medals, and even more had Ahn Hyun-soo not moved to Russia, where he is now competing as Viktor Ahn. China – Like South Korea, China also had its best ever showing in 2010, winning five golds and 11 medals and finishing seventh in the medal standings. But unlike South Korea, the Chinese are seeking to diversify their repertoire. While most of the Chinese medals in Sochi will still come on the short track, China is hoping to also medal in figure skating and men’s and women’s freestyle skiing. But an ankle injury will keep Wang Meng – a triple gold winner in Vancouver on the short track – out of the Sochi Games and might severely dampen Chinese ambitions. Japan – Unlike South Korea and China, Japan is coming off a disappointing 2010 Games in which it failed to win gold despite taking home five medals. And without a sport that it dominates, Japan’s hopes will hinge on single athletes in disparate events – but primarily in figure skating. Mao Asada, who finished second to Kim in Vancouver, is expected to again challenge for the gold in women’s figure skating. Japan might have a shot at multiple medals in men’s figure skating with a trio of strong contenders in Yuzuru Hanyu, Daisuke Takahashi and Tatsuki Machida. The only other Asian countries that have ever medaled in the Winter Games are Kazakhstan (two), North Korea (two) and Uzbekistan (one). And this year, the only non-“Big Three” Asian athlete who’s a medal contender is Kazakh cross-country skier Alexey Poltoranin. While Asian athletes have made giants strides in the Winter Games over the past two decades, the top of the medal standings will remain the exclusive domain of northern European and North American nations. In Sochi, look for Norway, Germany, Canada and the United States to compete for the top spot on the medal table.